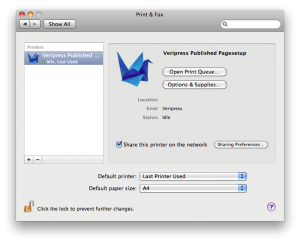 Even though you cannot print from Veripress, Pagesetup’s can be set up as Mac OS X system printer destinations to allow jobs to be easily submitted for proofing via the Print option of third party software or design packages. Jobs going to a published pagesetup will be automatically sent for processing and colour management in Veripress, eliminating the need for dropfolders or manual file submission. Note: Jobs processed via Veripress in this way must be in a file input format available to your Veripress version. Note on Port Numbers: It is recommended that the port number assigned to each pagesetup be a port over 10000 to avoid any conflict with the operating system or an existing application. Each pagesetup to be published needs its own unique port number, for example, 10200, 10201, etc. 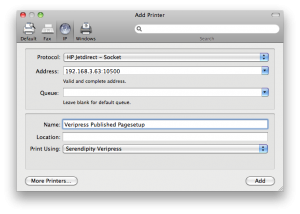 A system printer needs to be created and configured on the Mac OS X computer that is running the Veripress Server. Address – Enter the TCP/IP address and port information for the printer setup in the following format: ComputerIPAddress:PagesetupPortNumber (e.g., 192.168.3.63:10201). The IP address for the printer should NOT be used. 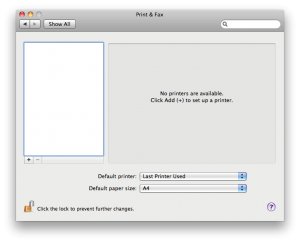 Print Using – Select Printer Software from the dropdown menu. 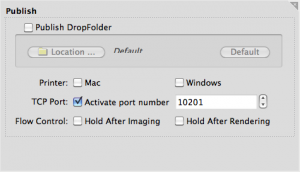 A list of available Mac OS X Printer Drivers will popup. Either scroll down the list and select Serendipity Veripress or type “Serendipity” in the filter field and select Serendipity Veripress and click OK.
Save the pagesetup configuration when done. A system printer needs to be created and configured on the Mac OS X computer running the Veripress Server. Choose the pagesetup from the Printer Name list. The pagesetup will be named “Pagesetup name @ computer name” and the Kind will be listed as Bonjour. 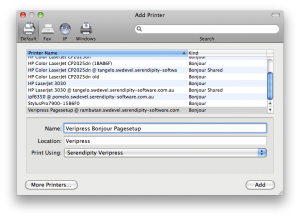 Print Using – If you have installed the Serendipity Printer Drivers the Print Using field should auto-fill to show Serendipity Veripress. 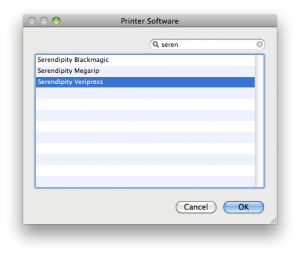 If the Serendipity Printer Drivers have not been installed, cancel the printer setup and install the drivers as per the instructions at the beginning of this document. If the field does not auto-fill choose Select Printer Software from the dropdown menu. 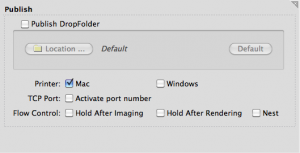 A list of available Mac OS X system printer drivers will popup. Either scroll down the list and select Serendipity Veripress or type “Serendipity” in the filter field and select Serendipity Veripress. Click Add. This entry was posted in Printing, Serendipity Client, Veripress, Workbench. Bookmark the permalink.